We have gone through four sleep studies with our son. Each study has gotten easier to endure as he gets used to the procedure. Why Would a Doctor Order a Sleep Study Test? There are several obvious reasons a child’s doctor may order a sleep study (polysomnogram) for a child: some kids have problems like night terrors, frequent waking, loud snoring, or sleepwalking. There are several less obvious reasons a doctor might order a sleep study: an Ear, Nose, and Throat (ENT) doctor may notice enlarged tonsils and prescribe a sleep study. Persistent bedwetting and some cases of Attention Deficit/Hyperactivity Disorder have been linked to children’s sleep disorders. 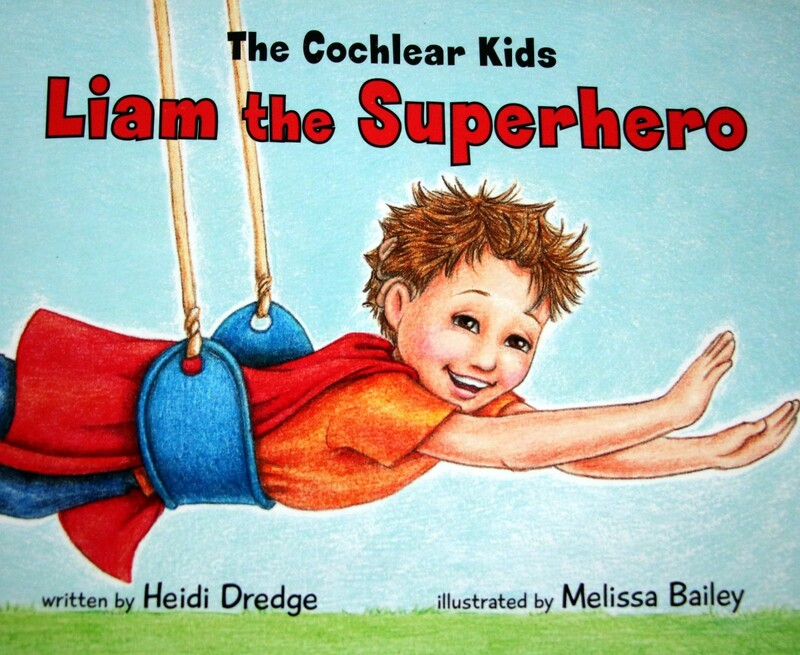 Our son had constant ear infections, and was due to have his third set of ventilation tubes placed (these are also known as grommets, or “ear tubes”). It is standard practice to remove the adenoids when the third set of tubes are placed, as enlarged adenoids can contribute to middle ear fluid. Our ENT wanted to determine if we should remove our son’s tonsils at the same time. To determine if his tonsils were posing any difficulties, she ordered a sleep study. In this case, our son did not present with any obvious sleep disorder (though he had never slept through the night; at two years old this is not an uncommon occurrence). The pediatric sleep study was simply ordered to determine whether he needed a tonsillectomy and adenoidectomy. Distractions - While the child is having various leads and sensors placed, a portable DVD player, handheld video device or other distraction will be of enormous help in keeping a child calm. A lollipop may also distract young children during the set-up of EEG leads and other sensors. Comfort items - Be sure to bring any comforting sleep items (a favorite stuffed animal or blanket) to the sleep study. Pajamas - Dress children in two-piece pajama sets without "feet." Many sensors will have to be threaded up the legs of the pants, and this is much easier to accomplish when two-piece pajamas are worn. 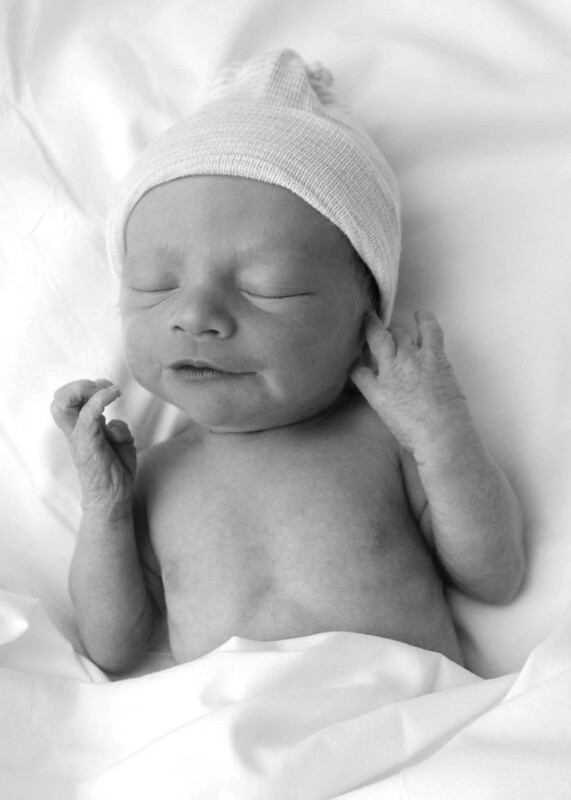 Infants who are nursing - For nursing moms, a sleep study can be a trying time. The baby is often in a crib and difficult to move because of all the attached leads. If possible, it is wise to express milk and feed the baby from a bottle during the sleep study. Choose wisely - Choosing a sleep center familiar with pediatrics is also wise: children benefit from technicians who know how to work with kids! How Is a Sleep Study Test Performed? 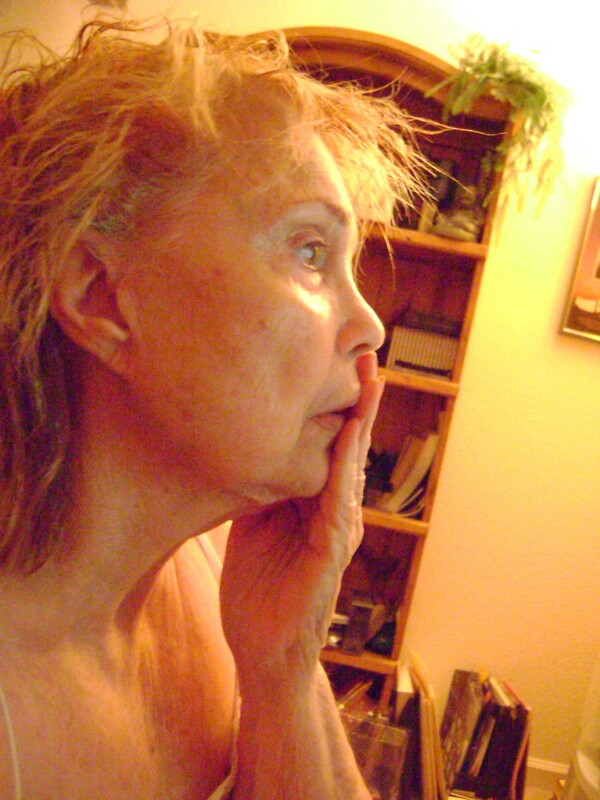 A sleep study test is an overnight procedure. An impressive amount of monitoring equipment will be attached to the child during the sleep study. It is a good idea to prepare your child for a lot of “stickers” and “strings” (the patches and leads that will be attached). Fortunately, no part of a sleep study causes pain: a child can be reassured that there will be no “ouchies” during the test. The most difficult part of a sleep study (for most children) is the placement of a nasal cannula in a child who has never worn one. This is a small tube that runs under the nose, with two small prongs that fit into the nostrils. 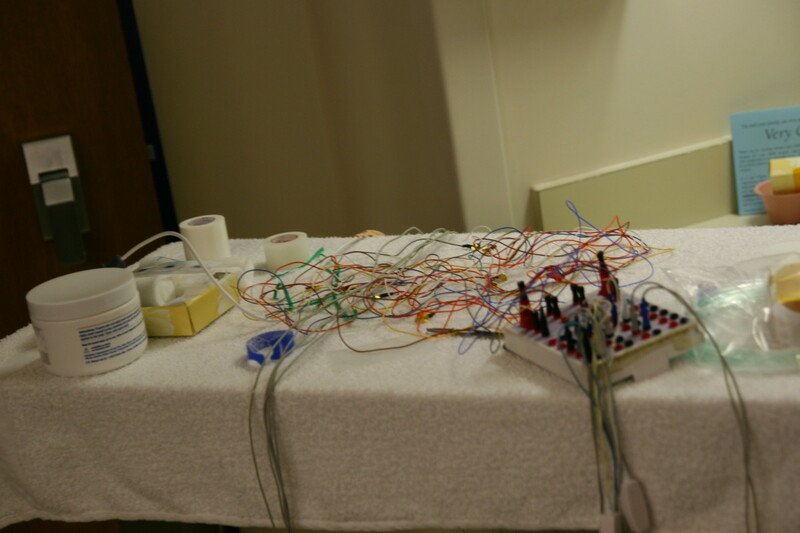 This is usually placed at the end of the sleep study set-up. 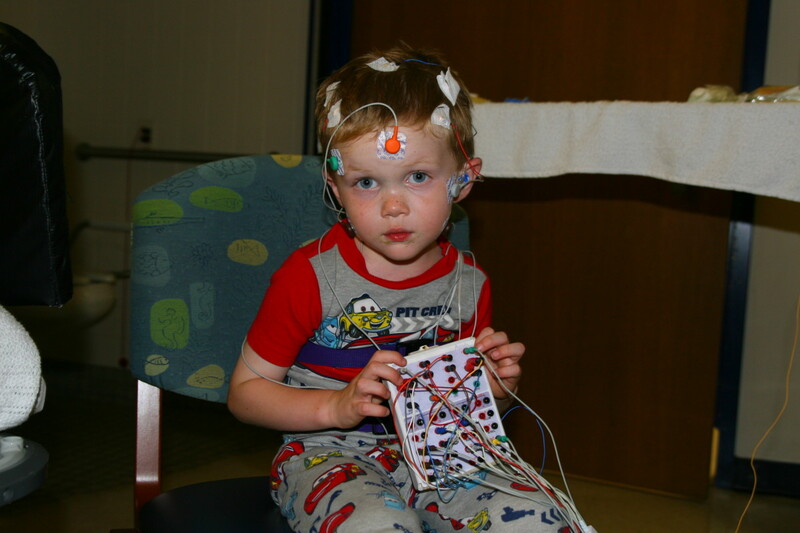 EEG Array: In most children, a partial EEG array will be attached to the scalp. The technician applies a small amount of “paste” to hold each EEG electrode onto the scalp. Gauze is then wrapped around the child’s head to hold the EEG electrodes in place. In some children, a full EEG array will be placed (this generally doubles the number of electrodes placed on the scalp). The application of these electrodes does not hurt in any way, though the child’s hair will be messy when the electrodes are removed in the morning. In some centers, a different type of glue will be used that will have to be dried with a special tool which blows cold air onto the sensors. This process may frighten some children, though the process is not painful in any way. Children should have clean hair (no hair gel or hairspray) to allow for the proper attachment of the leads. Face Electrodes: An electrode will be placed off to the side of each eye (near the temple) to record eye movement during sleep. Electrodes will be placed on the chin to detect mouth movements during the sleep study. Limb Electrodes: Electrodes will be placed onto each leg to record leg movement during sleep. EKG: Electrodes will be placed onto the chest to record the heart rhythm and pulse rate. Chest Belts: Belts with sensors will be placed over the chest to record chest expansion when the child breathes during the sleep study. Pulse-Oximeter: A sensor will be placed on a finger or a toe to record blood oxygen levels during sleep. Nasal Cannula: A nasal cannula will be placed under the child’s nose to record airflow and carbon dioxide (CO2) output. We have gone through four sleep studies with our son, and each sleep study has gotten easier to endure as he gets used to the various leads and monitoring equipment. 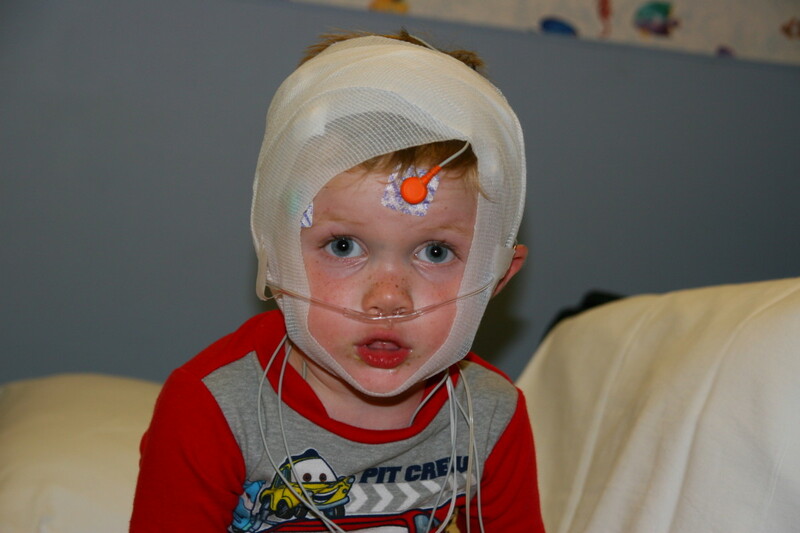 The first sleep study was the most difficult, because he was two years old and was very upset by the nasal cannula and the finger-tip pulse oximeter. Neither piece of equipment caused any pain, but the cannula was uncomfortable and the light on the oximeter scared him (the sensor gives off a red light). The sleep technician was wonderful, and simply waited until our son was asleep before attaching the pulse-ox. We also moved the pulse-ox to his toe and covered his foot with a sock to keep him from pulling the sensor off. The nasal cannula was more difficult, and we wrestled through most of the night, trying to keep the tube in his nose. Fortunately, he did sleep long enough during the sleep study to obtain the necessary information. At his most recent sleep study, our son tolerated all of the monitoring equipment without any fuss: he is older and more used to the equipment. The sleep efficiency will vary widely for each child, but the stated “norm” is 89% of the total sleep time. The sleep latency is how long it takes the child to fall asleep once the lights are turned out: this will also vary widely. Being attached to so many leads and other pieces of monitoring equipment may increase the time it takes a child to fall asleep, and may affect the sleep efficiency of the child as well. Monitoring the sleep stages will indicate if a child is getting enough REM sleep, and has normal “sleep architecture,” or a normal amount of time spent in each stage of sleep. 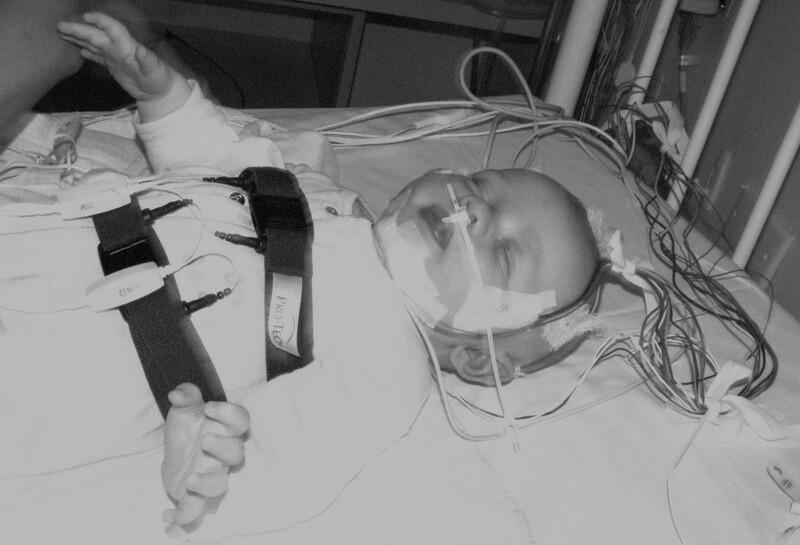 When our son’s first sleep study results were available, we were shocked (and a little frightened) at the results. His lowest oxygen level was 79%, and he had a high number of both obstructive and central apneas (severe obstructive and central apnea). A brain MRI was ordered to look for a cause of the central apneas, and a tonsillectomy was performed to try to reduce the number of obstructive apneas. A cause was never found for the central apneas, but fortunately the central apnea events have reduced over time. Our son is now four years old, and his central apnea has disappeared. The obstructive apnea, on the other hand, has only gotten worse. A second (follow-up) sleep study was performed about 4 months after the tonsillectomy and showed worsening obstructive apnea: this is a very rare event (tonsillectomies cure obstructive sleep apnea in the great majority of children). Our ENT decided to perform a bronchoscopy and sleep laryngoscopy (looking at his lungs and larynx) to determine where the obstruction was coming from. This test determined the presence of a condition called laryngomalacia, a condition where tissue is floppy and collapses over the voice box, obstructing air flow. A surgery was performed to fix the laryngomalacia, and a third sleep study was performed to determine if the surgery was successful. Unfortunately, our son fell into the small percentage of children who do not benefit from surgery, and he his third sleep study showed persistent obstructive apnea. Because his apnea is not surgically correctible, he now uses a Continuous Positive Airway Pressure (C-PAP) machine at home, to prevent apneas during sleep. Obstructive Sleep Apnea: In children, this is most often caused by large tonsils. Obesity can also cause obstructive sleep apnea. Rarer conditions, such as neuromuscular weakness, laryngomalacia, and tracheomalacia can also cause obstructive sleep apnea. If the cause is enlarged tonsils, a tonsillectomy will cure the vast majority of patients. Children with persistent obstructive apnea will likely require a C-Pap (or BiPap) machine to prevent the obstructions. The child’s doctor will prescribe the proper treatment as indicated by the symptoms and complete clinical picture. 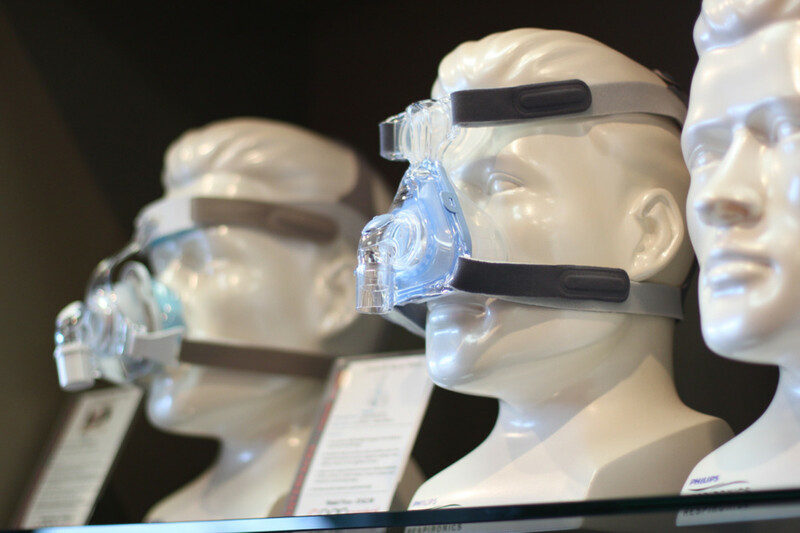 Central Sleep Apnea: Unlike obstructive apnea (which is a mechanical obstruction of airflow), central apneas are caused by a failure of the brain’s respiratory center to signal a need to breath. Conditions such as idiopathic central sleep apnea (central apnea with no known cause) and a rare condition called Congenital Central Hypoventilation Syndrome may cause central sleep apnea. Children who have a chiari malformation may also have central apneas. 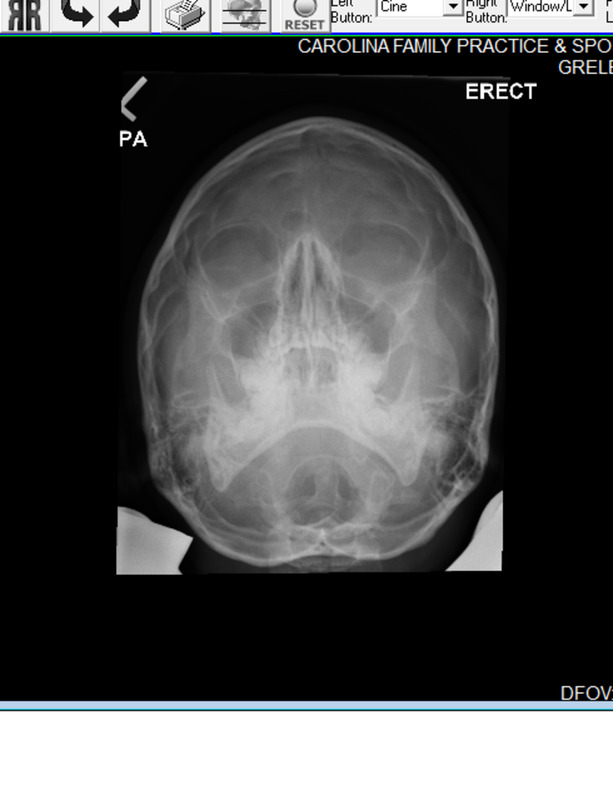 A brain MRI is typically ordered for children who present with significant central apnea. In the case of idiopathic central sleep apnea, some children have apnea that spontaneously resolves over time. Why Is it Important to Treat Pediatric Sleep Apnea? The vast majority of children will not have sleep apnea, or will have sleep apnea which is correctable via a tonsillectomy. 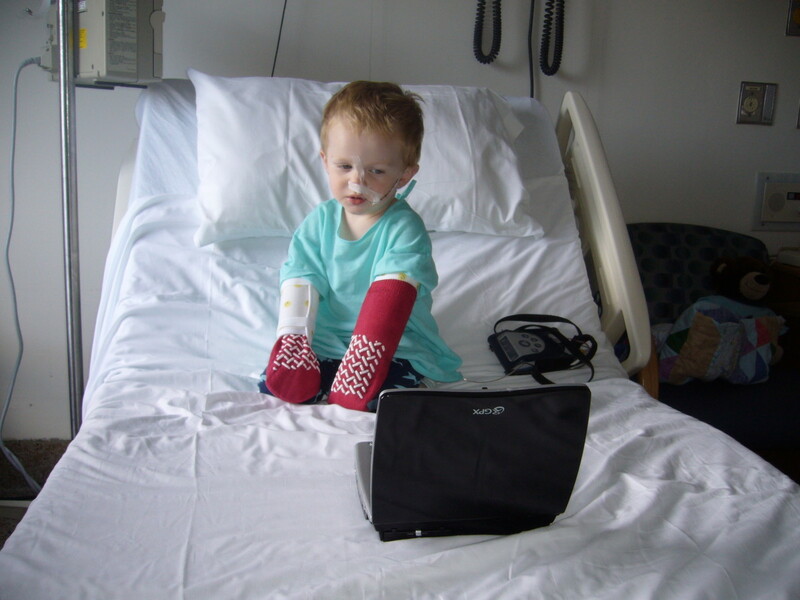 Some children will require support with a C-Pap (or BiPap) machine. Why must sleep apnea in kids be treated? Pediatric sleep apnea has been indicated in a wide variety of childhood conditions. Several studies show an increase in sleep apnea among children who suffer from Attention Deficit/Hyperactivity Disorder. Chronic bed wetting has been associated with obstructive sleep apnea in children. Children with severe, untreated apnea will suffer from cognitive problems brought on by insufficient sleep. Long term, severe apnea can lead to a condition called hypercapnia, which is excess carbon dioxide stored in the blood stream. In the worst cases, a condition called cor pulmonale (right sided heart failure) may develop. The good news is that most apnea is readily treated via a tonsillectomy or with a C-Pap (or BiPap) machine. Once the apnea is corrected, children are able to grow and develop in a healthy way. Laryngomalacia is a fairly common problem in infants, and can cause serious problems on occasion. Read about our journey with complicated laryngomalacia, and the causes and treatments for this disorder. Cpap use is not common in children, and it can be hard to find practical advice for helping children to adjust to Cpap therapy. A basic guide for starting Cpap therapy in children with sleep apnea. Thanks, pstraubie! My son has had four of them (he is almost 5 years old) and will have another soon. Our little guy has severe laryngomalacia (floppy larynx) and surgery failed to correct it, so he uses a C-Pap to treat his severe sleep apnea. There's a possibility that he has some low muscle tone complicating the picture - he calls the C-Pap his "space mask." I hope it helps parents who have to go through the same process! Thank you for sharing this. My daughter had a sleep study at about age 10 as she was having seizures. It was a bit unneerving at first but we were fortunate to have it well explained to us. My grandson (the eldest who is now 17) has had them about every 2 years because as part of his malady he has severe sleep apnea. So now we kind of know what what happen. 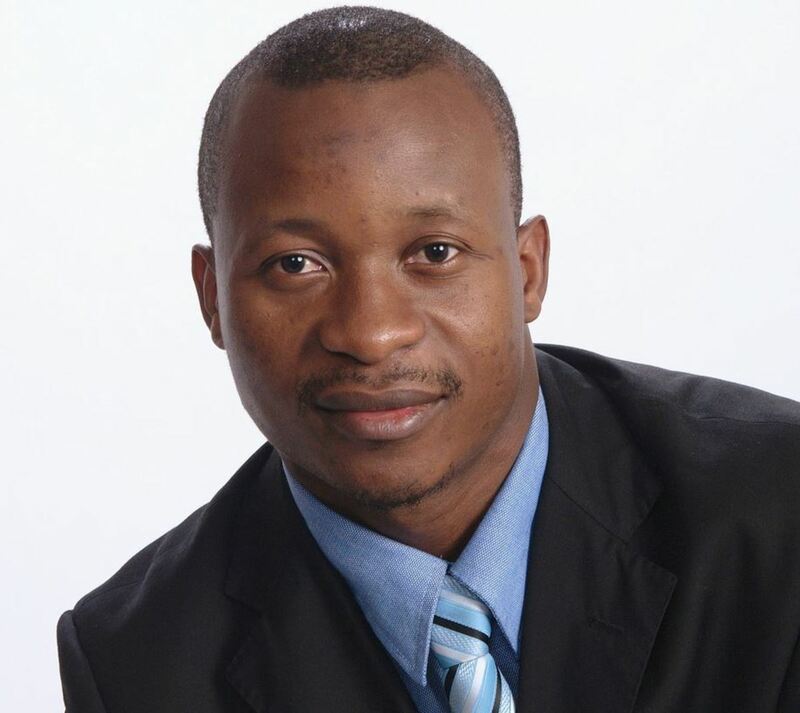 I know that those who read your article will appreciate the information you have provided. Nolan did great during most of the set-up. 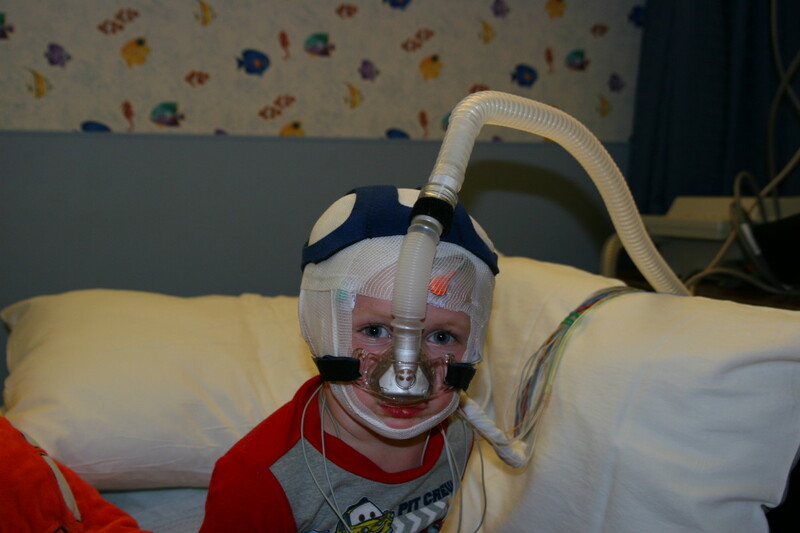 The photos were actually taken during his CPap set-up, so he had a mask/hose on top of everything else by the end. The mask sent him over the top - we should get the machine from the home healthcare company fairly soon, and that will be an entirely new adjustment. We hope that he'll adjust quickly -he is an amazing little guy! It is really hard to find first-hand accounts of parents who have gone through sleep studies with their little ones. Our son is a real trooper through them now - I actually took pictures this last time to make an experience book for him (since these tests will be done periodically to assess his apnea). Bless his little heart, he looks so sweet. Thankfully there is no pain involved. As always, your Hub is well laid out, full of information and interesting.